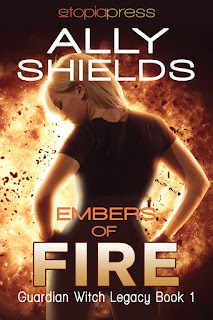 The review tour for Embers of Fire (Guardian Witch Legacy Book 1) kicks off today! This is the first book in a continuations series to Ally's amazing seven book Guardian Witch series. Make sure you check out the reviews and enter the GIVEAWAY for a $25 Amazon Gift Card and a cool handmade bookmark! A chilling prophecy. A child in danger. Following the defeat of the vampire elders, Guardian fire witch Arianna Calin and vampire prince Andreas De Luca are considering moving to his estates in Italy to raise their daughter in its idyllic setting. As if being descended from two powerful witch bloodlines wasn't challenging enough, Rayne was born with a mysterious star tattoo on her shoulder. Her parents suspect she is the Chosen, the focus of the Star of Esielen prophecy. But that's something to worry about in the distant future. Isn't it? After all, their child may be precocious, but she is only five. Then the murders begin. The stench of demonic activity hangs over Olde Town, and a symbol carved in blood indicates Rayne may be the next victim. Suspicion points in several directions: a rival vampire prince, a mysterious stranger, and a werehyena leader attempting to break the bank at Andreas's new casino. Abandoning plans for a quiet life, Ari and Andreas hunt for the killers. While Rayne may someday have to face her destiny alone, it's up to them to make sure she's ready...and to keep her alive. A crisp breeze caught the last of the early morning fog and swirled it over the gravestones. The Olde Town cemetery slowly emerged from the mist, its silent memorial to the dead marred by an unusual amount of activity. A uniformed Riverdale cop completed a final loop of bright yellow tape around several stone vaults and two small crabapple trees. CS techs snapped photos and set out evidence markers as they processed the crime scene. With a hot Styrofoam coffee cup in each hand, Arianna Calin bumped her jeans-clad hip against the iron entrance gate, knocking it open, and slipped inside, her footsteps crunching the brittle September leaves. When an eerie chill nudged her senses, she swept the scene with a sharp glance. Nothing she hadn’t expected. Not yet. Nothing bad enough to trigger her witch alarms. But then, it was a graveyard. The remnants of so many dead souls could mask a great deal. She ducked under a high section of the bright tape and focused on the blond man in jeans and a dark gray sweatshirt crouched beside a still form. “ME’s not here yet?” she asked. “OK. Show me. What have you got?” She stepped around him, the humor slipping from her lips at first sight of the victim. Vivid red blood stood in stark contrast to the middle-aged woman’s light lemon sweater. Not a typical stabbing…her throat had been slashed, leaving a spray pattern of arterial blood on the fading grass around her and a glistening trail down the sides of a gaping wound. It had soaked her neckline. Ari’s nostrils flared, taking in the sharp, metallic scent and seeking something more, whatever had triggered Ryan’s reaction. All kidding aside, working with him for eight years meant she trusted his gut feelings almost as much as her magic. Ally Shields grew up in the Midwest along the Mississippi River, still considers herself "a river rat," and currently resides near Des Moines. After a career in law and juvenile justice, she turned to full-time fiction writing in 2009. Her first urban fantasy, Awakening the Fire (Guardian Witch #1) was published in 2012, and she currently has thirteen published novels. She loves to travel in the US and abroad and incorporates many of those settings into her books. Ms. Shields enjoys chatting with readers through her website/social media and can frequently be found on Twitter. GIVEAWAY: Enter to win an Amazon Gift Card from Ally and a handmade bookmark from Little Inks! 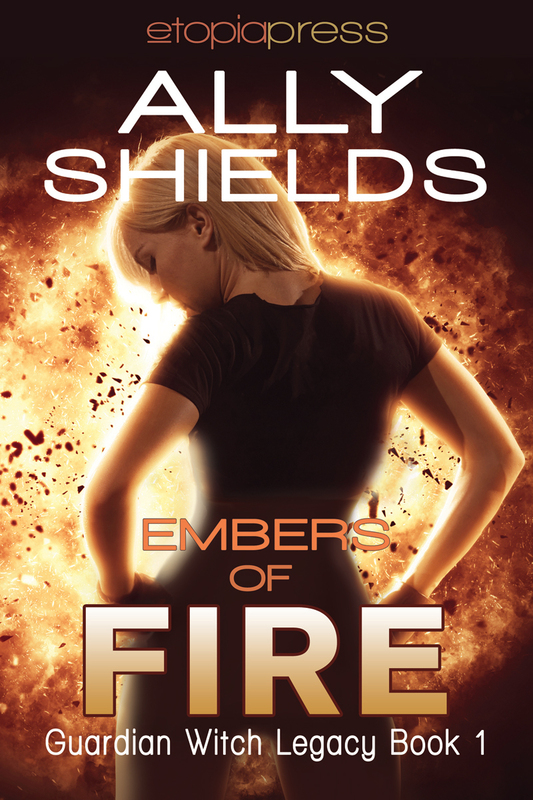 Today is the promo blast for Embers of Fire by Ally Shields! This is a continuation series from her amazing Guardian Witch series so you're gonna want to make sure you check this out! Check out the schedule and stay tuned for the upcoming review tour with a giveaway! Today kicks off a week long spotlight Promo Tour for The Maker Chronicles by Danielle DeVor. Check out the schedule and make sure you grab this trilogy at a special bundle price! From Examiner’s Recommended Women in Horror comes THE MARKER CHRONICLES by Danielle DeVor. The First Trilogy contains books 1 – 3. Now, for a limited time, save BIG by buying this special bundle deal at a killer price! Not All Exorcists are Equal....One is Marked When defrocked ex-priest, Jimmy Holiday, agrees to help an old friend with his sick daughter, he doesn’t expect the horrors that await him. Blackmoor, his friend’s new residence, rests upon the outskirts of the town of Sorrow’s Point. The mansion’s history of magic, mayhem, and death makes it almost a living thing – a haunted mansion straight out of a Stephen King novel. Jimmy must decide if the young girl, Lucy, is only ill, or if the haunting of the house and her apparent possession are real. After the house appears to affect him as well with colors of magic dancing before his eyes, rooms warded by a witch, and a ring of power in his voice, Jimmy is met by a transient who tells him he has “the Mark.” Whatever being “marked” means, Jimmy doesn’t care. All he wants to do is help Lucy. But, helping Lucy means performing an exorcism. Uncovering The Truth…Will Take An Exorcist Jimmy Holiday, defrocked priest turned exorcist, is trying to get his life in order. With his on-again off-again witchy girlfriend moving in, the spirit of the little girl from his last exorcism hanging around, and a secret organization of exorcists hounding him, Jimmy equals stressed. When a stranger calls in the middle of the night asking for help with a possession, Jimmy is about to land in a mess of trouble. Especially since the man on the phone claims to have gotten his number from Jimmy’s old mentor. Too bad his mentor has been dead for years. After a mysterious silver flask arrives at his doorstep, Jimmy is left with two options: either ignore the newest enigma the universe has tossed him, or listen to Lucy and travel to Arizona to solve the mystery before all hell breaks loose…again. Some things are worse than demons. Jimmy Holiday, reluctant exorcist, is finally getting the help he needs from the higher-ups. The Order of Markers is sending him to the Vatican’s exorcism school. Now, he’ll receive the training he should have gotten at the beginning. One problem, someone wants to sabotage him. When his time at the school is cut short, Jimmy receives an interesting new case. It is the assignment that no one wants—a corpse has come back to life. And it isn’t a zombie. Too bad nothing goes as expected. Armed with his usual bag of tricks, Jimmy thinks everything will eventually be all right. Well, that is until his betrayer turns out to be the person he trusts most. Named one of the Examiner’s 2014 Women in Horror: 93 Horror Authors you Need to Read Right Now, Danielle DeVor has been spinning the spider webs, or rather, the keyboard for more frights and oddities. She spent her early years fantasizing about vampires and watching “Salem’s Lot” way too many times. When not writing and reading about weird things, you will find her hanging out at the nearest coffee shop, enjoying a mocha frappuccino. The two week Spotlight Tour for Sam's Legacy by Shirleen Davies is on now! Check out the schedule and don't forget to enter the GIVEAWAY! Samuel Covington, ex-Pinkerton agent and deputy in the frontier town of Conviction, has come a long way from his upbringing in Baltimore. His job, and a particular woman, occupy his time and thoughts. His future is assured—until a message from home tears it all apart. Jinny MacLaren loves the ranch, her family, and one particular deputy. Even though Sam’s never said the words, she’s certain of his feelings, envisioning a future as his wife—until the day he announces he’s leaving without a promise to return. His future no longer belongs to him. Sam never anticipated the news awaiting him, or the consequences of a past he’d left far behind. Shoving painful thoughts of Sam aside, Jinny focuses on a life without him, allowing a friendship to grow with someone else. He’s handsome, smart, and caring, yet in Jinny’s heart, he’ll never be Sam. As both face an uncertain future without the other, neither anticipates the dangers stalking them. Protecting what’s his is Sam’s calling. Reclaiming what he left behind may prove to be the biggest challenge of his life. Sam’s Legacy, book four in the MacLarens of Boundary Mountain historical western Romance Series, is a stand-alone, full-length novel with an HEA and no cliffhanger. Looking around, he eased her between two buildings, out of the range of prying eyes and ears. Placing his hands on her shoulders, he held steady, even as she twisted to leave. Letting his hands slip from Jinny’s shoulders to stroke her arms, he felt her shiver, his own body tightening. A life with her was what he wanted. He’d thought of little else the last few months, yet it may now be out of his control. His resolve began to slip as she moved closer, her feelings for him clear on her face. Even as his hands moved to her back, he knew it was a mistake. Drawing her to him, he leaned down, brushing a soft kiss across her lips. Seeing the intensity in her eyes, feeling her hands tighten on his arms, he took her mouth again, letting passion take control. A thrill rushed through him as he realized she knew little of what was happening. He doubted she’d been kissed before, yet her response was immediate. Moving his lips across her jaw, trailing kisses down her neck, he felt a shudder rush through her. Her soft plea brought an unwelcome flash of sanity. Placing one more kiss on her lips, he pulled Jinny close, tucking her head below his chin. “A few days then.” Her voice was devoid of all emotion. “Then I won’t see you again.” She tried to smile, but couldn’t manage it. “I wish you the best, Sam. Always the best.” Without waiting for him to respond, she hurried away, leaving him feeling a loss greater than he’d ever known. Shirleen Davies writes romance—historical, contemporary, and romantic suspense. She grew up in Southern California, attended Oregon State University, and has degrees from San Diego State University and the University of Maryland. During the day she provides consulting services to small and mid-sized businesses. But her real passion is writing emotionally charged stories of flawed people who find redemption through love and acceptance. She now lives with her husband in a beautiful town in northern Arizona. The two week Spotlight tour for Thorn's Journey by Shirleen Davies is on now! Check out the schedule and make sure to enter the giveaway for a $20 Amazon gift! Description: Welcome to Burnt River, a new series of Contemporary Western Romance stories set in the fictional town of Burnt River, Montana. Brought to you by Shirleen Davies, Peggy L Henderson, Kay P. Dawson, Tristi Pinkston, and Kate Cambridge. Thorn’s Journey, Book Two, Burnt River Contemporary Western Romance Series, by Shirleen Davies. Thornton “Thorn” Macklin, ex-Special Forces sergeant, has returned home to focus on his future. Scorpion Custom Motorcycles is one of the two dreams he pushed aside when he left Burnt River. The second dream? Well, it died long ago. Grace Jackson works hard to be successful, trying to forget the one great mistake from her past. Returning to Burnt River to work for the family business forces her to confront her future—as well as the man who shattered her heart. Being close to his brothers, helping at the ranch, and working with lifelong friends is exactly what Thorn needs. The last person he expects to see is the woman who vanished from his life without a word. Now she sits in her plush office down the street, resurrecting emotions, as well as memories he’d buried long ago. Not only must he confront his feelings for Grace, he and his friends face another danger. Someone wants their new business to fail, and isn’t above putting people at risk to achieve this goal. Guarding against threats is what Thorn does best. Protecting his heart from the woman he’s never forgotten is another matter. Could coming home, and the hope of a second chance, be his ultimate journey? Thorn’s Journey, book two in the Burnt River Contemporary Western Romance Series, is a full-length novel with an HEA and no cliffhanger. She jumped, startled at the familiar voice. Twisting around, she saw Thorn a few feet away, a bag from Evie’s in his hand. Pushing aside the lump in her throat, she gestured to the other side of the table. “Go ahead.” Picking up her drink, Grace did her best to ignore him and the butterflies now lodged in her stomach. Unwrapping his sandwich, Thorn couldn’t seem to move his gaze away from Grace, studying her features for signs of the girl he once loved. Taking a bite, he chewed slowly, making her squirm under his intense gaze. “Did you follow me?” She took another bite, but the sandwich now tasted more like cardboard than chicken salad. She looked around, expecting to see Josh and Tony walk up any minute. Grabbing her drink, she took a long sip, deciding the best way to deal with him being so close was to talk. “I eat here all the time. Two or three times a week, in fact. Sometimes there are families with children, but most days, it’s quiet, like today. I’ve even brought my fishing rod a few times, although I’ve yet to catch anything. Seems the older I get, the less luck I have. I…” Her voice faded when she saw Thorn raise his hand. “Do I make you nervous?” He wadded up the sandwich paper, easily tossing it into a can several feet away. He mimicked her behavior, crossing his arms, although his lips turned up at the corners. “Then why are you babbling? I don’t remember you being so chatty.” Some perverse pleasure washed over him when he saw her face redden, her eyes going wide. Without an inkling of warning, she picked up her cup and threw the contents at him. Shock came in an instant, followed by disbelief, then a sputtering laugh as he stood, letting the liquid sluice off him. Grabbing her trash, she tossed it into the can, then picked up her purse. “You’re such a jerk, Thorn. I don’t know how I ever loved you. Leaving here was the best decision I ever made.” Her stomach twisted when his smile disappeared, replaced with something she couldn’t quite define. Standing, Thorn stepped beside her, leaning down to whisper in her ear. “You’re right. My love would never have been enough for you. I’m all the things your father thought—and worse.” Straightening, he adjusted his sunglasses and strode away, not bothering to check her reaction. If he had, he’d have seen the indignation of a moment before replaced with grief and regret, tears welling in her eyes at the love they’d lost and the pain that replaced it. I'm A.J. Locke, an author who founded Red Moon Book Tours in order to help my fellow authors with their book tours by providing quality, affordable services.